Application questions let you and the applicant communicate about any aspect of the application process. Normally, the applicant will ask you questions, but you can also initiate a question yourself. Application questions consist of a subject and a question—basically, they're just like an email. Each question gets its own page. In the main column you can see the most recent comment, an area to write a reply and update the status, and a complete comment history. Question comments can be either seen by the applicant or for internal use only. Click Ask a question in the right column. Enter a subject and type your question or comments. If you like, you can attach a file. Click Submit to create the question. It will be emailed to the applicant. Applicant can see this comment: Check this to email the comment to the applicant, together with any attached files. Leave this unchecked to hide the comment/files from the applicant; it will only be visible to Admissions staff. Attach files: If you attach files, they'll be emailed as attachments to the applicant (if you make the comment visible to the applicant). Otherwise, they'll just be appended to the question's comment history. 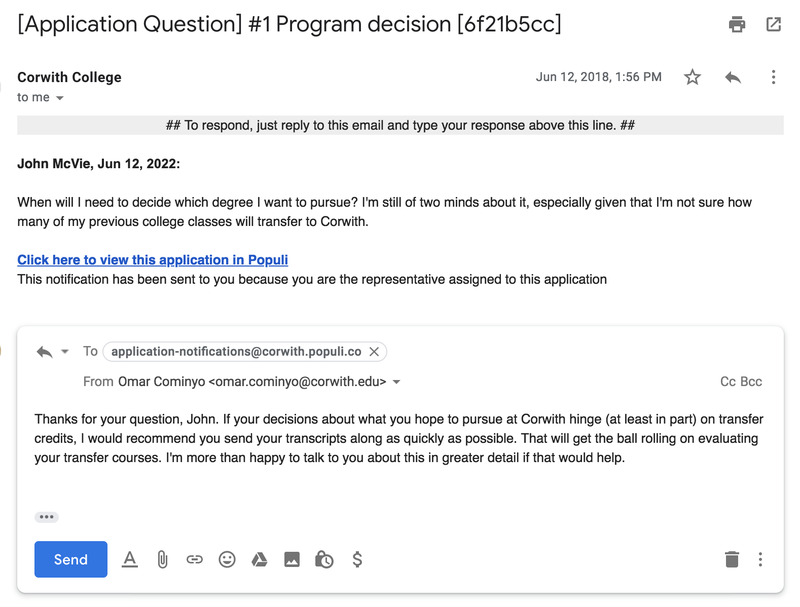 When you receive an application question via email, you can update it just by replying to it. Everything you enter above the "## To respond…" line will be sent to the applicant and included as a comment in the question's history. After you send the email, the question's status will be set to Awaiting applicant response (you can't set a question to Solved via email). Applicants can ask questions by going to their application and clicking the Ask a question button at the top of the screen. Applicants can submit new comments, attach files, and mark questions Solved. They can also add new comments by replying to the email they receive when you enter new comments (works the same for them as it does for you).